As the air is getting crisper and the fight against turning the central heating on has been lost there is only one thing left to do – make pie! Winter pies will warm your belly and your soul. They are so easy to make, you can chuck anything into them and they will always taste delicious and give you an overwhelming sense of self-worth! Everyone loves pie. Creamy soft potatoes with buttery leeks is one of my favourite combinations. 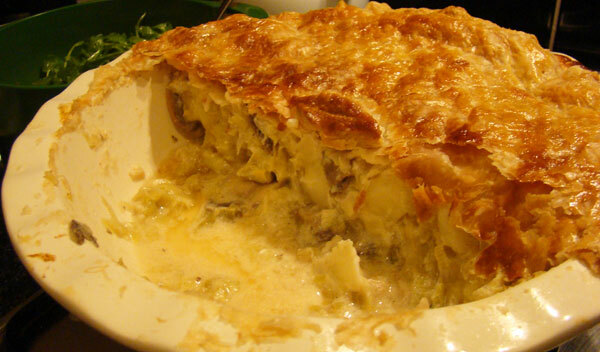 Add some mushrooms and sprigs of rosemary and thyme and you have a winning winter pie. Peel and chop the potatoes into chunks. Bring a saucepan of water to the boil and add the potatoes. Cook until just soft, then drain. Whilst the potatoes are cooking, chop the leeks into rounds and slice the mushrooms. Add the butter to a pan and saute the garlic, add the mushrooms then the leeks. Brown lightly then add the cup of vegetable stock. Simmer for approx 10min. Add the potatoes to the mushrooms and leeks. Roughly chop the rosemary and thyme and add to the saucepan. Stir through the creme fraiche. Generously season with salt and pepper and remove from the heat. Transfer the vegetables into a pie dish. 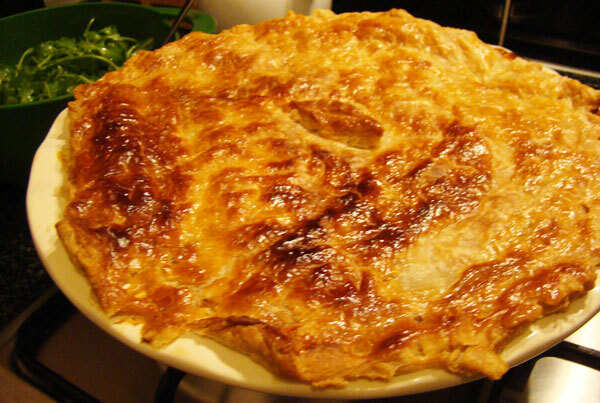 Carefully place the pastry over the pie and trim the edges. Brush the pastry with egg. Bake in the oven for approx 30min until the pastry is golden brown.